Oh the Lung Airways are connected to the Stretch Receptors and the etc. Student: The Airways are connected to the Pulmonary Stretch Receptors that are connected to the Vagal Nerves. Then they are connected to what next? Student: BOTH models’ bottom loops are almost IDENTICAL. Sensory Feedback to the Brainstem Respiratory Center. Student: Davenport (2007) also identifies Sensory Relay Nuclei. Professor: On our 1993 model we show a collateral from Brain Stem Respiratory Center that is sending an Efference Copy to a comparator in brainstem. 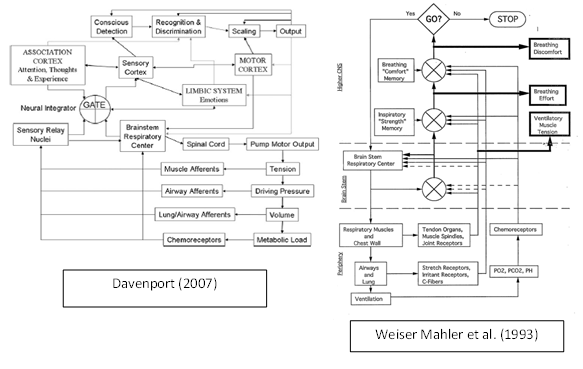 Any difference between the Efference Copy and the Pulmonary Afferents Feedback becomes an Error Signal. The vagal fibers synapse in the brainstem perhaps directly on the Brainstem Respiratory Center. The second-order neurons are part of Sub-Cortical Central Nervous Processing. Professor: I would add the Insula to these structures, say above right Thalamus VPL & Posterior Thalamic Nuclei box and below the Amygdala box. Student: You keep on telling us to disregard structures per se and more importantly look at regional functional connectivity, i.e., to concentrate on the networks that utilize various structures. Student: Which parts of the Limbic Network extend into, or perhaps out of, the Sub-cortical Central Nervous Processing level? core affect generation: representing visceromotor states from prior experience or engaging visceromotor control of the body to create the core affective tone (pleasure or displeasure with some degree of arousal) that is a basic feature of all conscious experience and that directs basic approach/withdrawal behaviors. “We include subcortical structures in this network based on their known anatomical connections. “We include the nuclei of the basal ganglia, which are involved in orchestrating effortful behavior and motor control . “We also hypothesize that the central nucleus of the amygdala, which is involved in producing autonomic responses , and the midbrain periacqueductal gray, which is involved in coordinating coherent physiological and behavioral responses , are part of this network. Student: I would like to learn more about these networks! Professor: How about analyzing distributed neural networks used by meditators while noticing their mind wandering and switching their mental activities back to their breathing? Next: Awareness occurs from increased activity of Salience Network to inhibit Default Mode Network activity resulting In a wandering mind. Davenport FW, Vovk A. 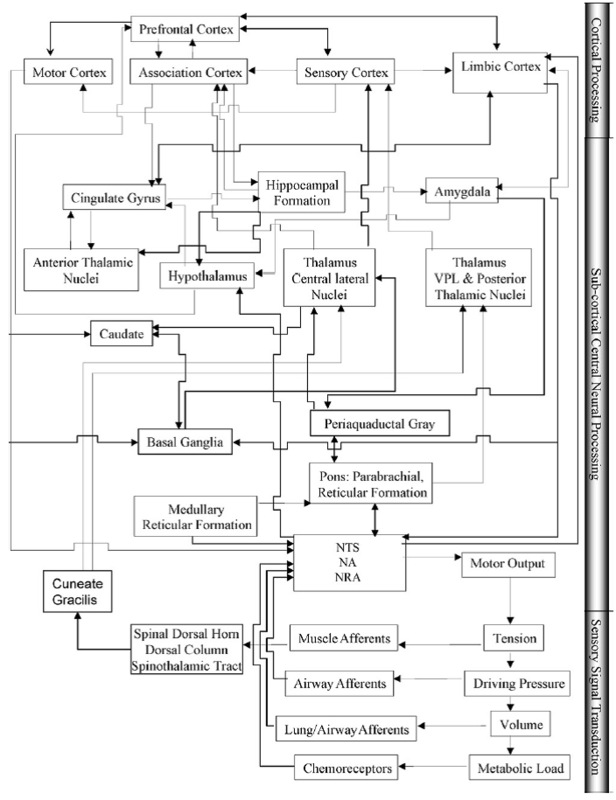 (2009) Cortical and subcortical central neural pathways in respiratory sensations. Resp Physiol Neurobiol 167: 72–86. Lindquist KA, Feldman Barrett L. (2012) A functional architecture of the human brain: emerging insights from the science of emotion. Trends Cogn Sci 16: 533-540. Oosterwijk S, Lindquist KA, Anderson E, Dautoff R, Moriguchi Y, Feldman Barrett L. (2012) States of mind: emotions, body feelings, and thoughts share distributed neural networks. Neuroimage 62, 2110–2128.